Poor circulation can have a detrimental effect on the body, particularly the lower limbs, is vital to ensure good blood circulation. So go for a walk from the comfort of your chair! simply put your feet on the HappyLegs and using the remote control take yourself for a walk. 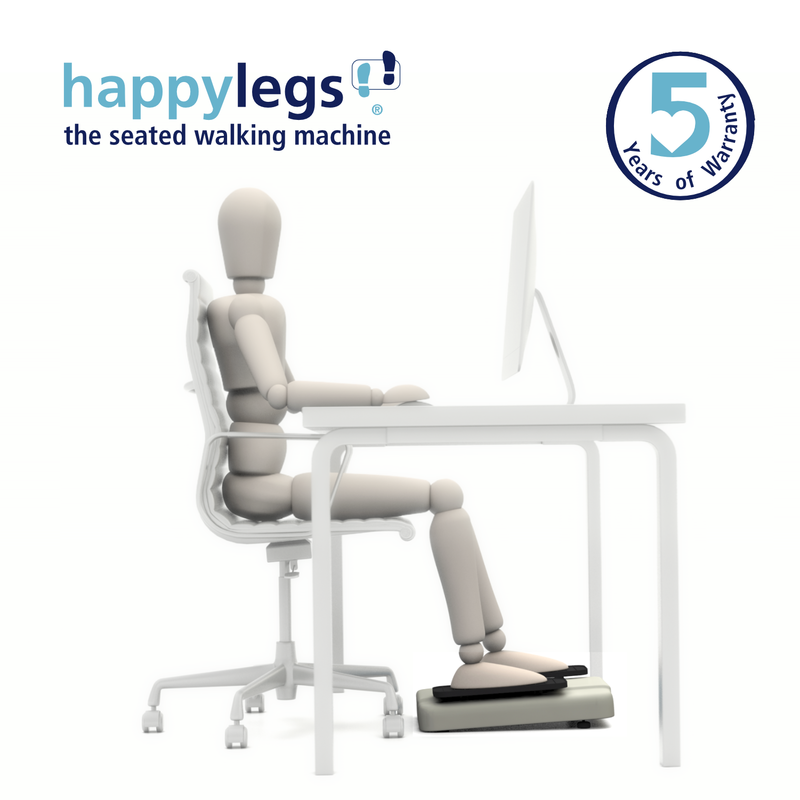 HappyLegs is a passive exercise device which is based on the principles of walking. It alternatively moves the legs and gently massages the feet while the user remains seated stimulating the muscles and sole sponge to help improve blood circulation. It is a patented exercise device that provides gentle, consistent and vibration free exercise for people who spend a lot of time sitting or require assistance for walking. happylegs has been designed with ergo therapy in mind in that its movements are precise, continous, gentle and comfortable and it is not aggressive to ankle and knee joints. 3 speed settings with remote control. HappyLegs doesn't use electric stimulus therefore suitable for pregnant women or those with pacemakers. Uses natural movement to stimulate blood flow. Can be used with footwear. No side effects or restrictions. Clinically proven to improve blood circulation in the body, particularly the lower and upper legs. Manufactured in Europe and certified in the EU to CE standards. Using the product from as little as 30 minutes a day can significantly help to reactivate the venous return circulation, reducing swelling in the joints, ease recuperation of patients undergoing vein treatment and prevent stiffness in knees. 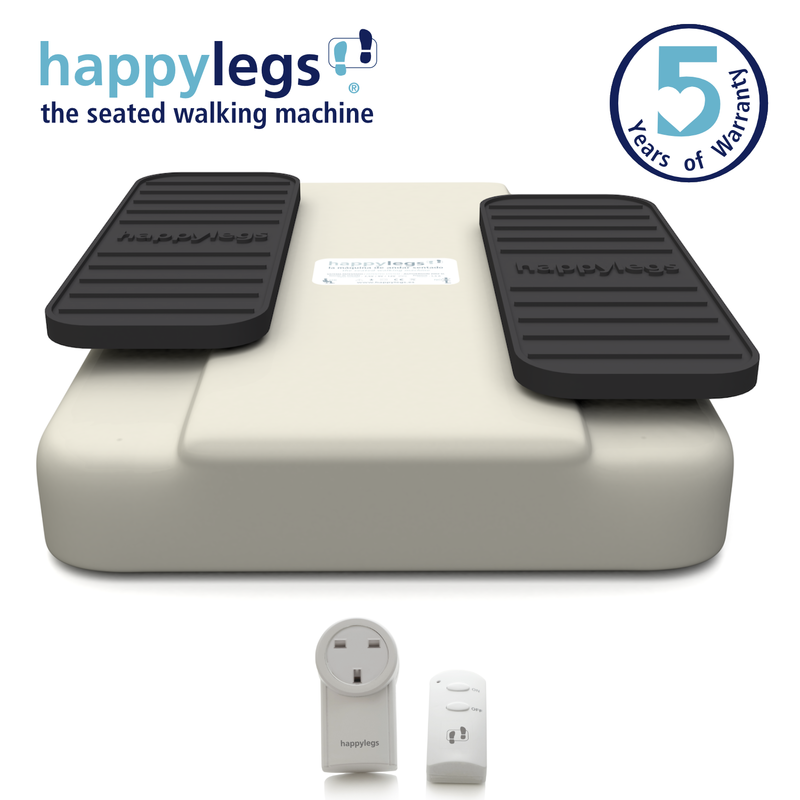 A. HappyLegs is a patented exercise device that uses an extremely silent motor to provide continuous movement that move your legs alternatively without the need for any physical effort. Q. Is it quick to set up? A. Yes it is! Seconds in fact. All you have to do is place your feet on the device footplates and set it away using the remote control. As simple and a quick as that. Q. Is it clinically approved? A. Yes! The HappyLegs device is clinically proven to improve blood circulation in the body, particularly the lower and upper legs. 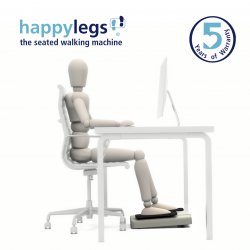 Studies carried out by vascular surgeons and phlebologists consider the HappyLegs device extremely beneficial to people who lead a sedentary lifestyle and suffer from chronic venous insufficiency and other typical venous ailments. The benefits of using the HappyLegs device are support by a therapeutic report from the Foundation for the Study and Prevention of Venous Diseases in Madrid. Q. Can I use it standing up? Q. Does it use electrodes or electrical pulses to stimulate the muscles (EMS)? Q. Are there any restrictions on its use? Q. Is there a time limit on its use? A. No! There is no time limit on the usage of a HappyLegs; you can use it for a little or as much as you want, anytime of the day. Three hours use is the equivalent exercise to one hour of normal walking. Q. Can I use it with shoes? A. Yes! You can use HappyLegs with footwear, wearing just socks or in bare feet. Q. How heavy is it and is it portable? Q. Where is Happylegs manufactured? A. HappyLegs is manufactured in Europe and certified to meet EU and CE standards. So put on the TV, radio or get a good book, sit back, relax and let HappyLegs take you for a walk. I\'m very pleased with my Happy Legs Walking Machine,it is so easy to use and although I haven\'t been using it for long I feel it is doing my swollen legs good. My Mum wanted this as she thought it would do her legs good. She has used it quite a few times and is pleased. Active Mobility Centre gave the best price and it was delivered on time, would use them again if we needed something. delivery ontime.item appears to be of good quality and working well.will see in time how effective. Very pleased with the machine workd very well. Gentle easy way to exercise my legs and help my circulation which wasn\'t too good as I\'m in a wheelchair. I noticed the difference in colour in my legs and feet almost immediately. Easy to use, not too heavy....I have it under my computer desk so I exercise without really noticing! Great purchase ! Very pleased that we bought this. My father loves it and uses it for several hours at a time. No more swollen ankles and improved balance when walking. The remote control could be better designed with larger buttons and the speed control is a voltage adjustment on the power supply so not quite perfect but definitely worth buying. Today we received your parcel - the Happylegs Seated Walking Machine.Fantastic gift for my father-in-law. Great product,service and delivery.Will surely use your services again in the future. This has been a godsend for my husband who has restricted mobility. During the winter and when on his own Happy Legs provides him with some exercise that he feels does make a difference. Whilst it does not replace going for a walk, it does aid circulation in the lower legs.